American Classical Orchestra is Mr. Crawford's ongoing project, devoted to playing orchestral and choral works, mostly from the 18th and early 19th centuries. On Tuesday night, Mr. Crawford led the orchestra from the harpsichord, occasionally settling for a look or a tilt of the head when the instrumentation got busy. The performance started wit ha long, thoroughly Classical overture, with extensive writing for woowinds, strings, and"natural", valve-less horns The orchestra was onstage, with the action on the apron, an intimate setting that recalled this work's courtly origins. As with most of Haydn's stage works, L'Isola disabitata (The Desert Island) was created or the entertainment of the first Prince Nikolaus Esterházy, his longtime patron. It is a lightweight, four-handed comedy with lashings of drama,more exciting for its musical innovations and wit than a great story. Part of the problem is the lead-footed libretto by Pietro Metastastio, the story of a couple seperated and then reunited after the husband was kidnapped by pirates, a plot device which is as tired as it sounds. Regrettably, the opera was without projected titles, and the dim, burnished lighting of Alice Tully Hall made reading the provided librettos an ocular challenge. There were no pirates at Alice Tully Hall on Tuesday night, just two louche sailors who served as stagehands, bringing fake palm trees, umbrellas and (oddly) a stuffed parrot and a stuffed baby deer on and off the stage as needed. The heroine is Constanze (Sarah Brailey)) abandoned, Ariadne-like on the island for 13 years. Her sole companion is Sylvia (Sheherezade Panthaki) her little sister, an innocent who chiefly serves as comic relief. As Sylvia, Ms. Panthaki owned the central stretch of this two-act opera, singing with radiant tone and a brilliant upper register that thrilled the audience. Haydn's wit and sparkle was lavished on this character, who arrived on the island as a baby and grew up an innocent. Mr. Crawford injected wit and spark;e into the orchestral accompaniment. One could feel the composer's sympathy with her character's comic plight, a welcome contrast to the gloomy, suicidal attitude of her sister. Ms. Brailey sang her part with a big instrument that turned brassy when put under pressure in the first act of the opera. The libretto has her character offstage for most of the middle action of the show after her character contemplates suicide. In the second act she returned in much better voice, singing in her recognition scene with her long-lost husband and in the big formal quartet that reunited the lovers under rainbow beach umbrellas. The central joke (if you can call it that) in this story is that an abandoned wife gets her hubby back, not because he was callow or feckless, but because he was prisoner of the aforementioned pirates. 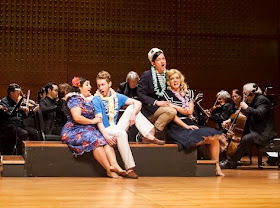 As Gernando, tenor Owen Mackintosh rocked a yachting hat and sang with pitch-perfect precision, using his upper register to soar above the ensemble. Baritone Timothy McDevitt played his faithful friend Enrico, impressing with snappy comic timing and a smooth onstage presence that crackled with energy. Perhaps, in a better opera, these fine young singers can make a strong impression in the years to come.